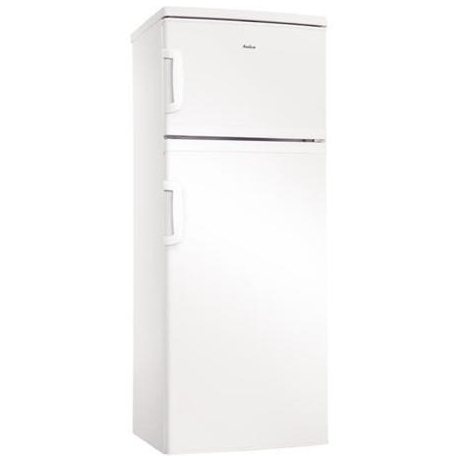 This Amica Top Mount Fridge Freezer is a freestanding model that is perfect for those with smaller refrigeration requirements. It comes with 4 glass shelves, a salad crisper, 4 in door balconies and a 4 star rated freezer. With the adjustable thermostat, reversible doors, interior light and adjustable feet this appliance offers flexible food storage. 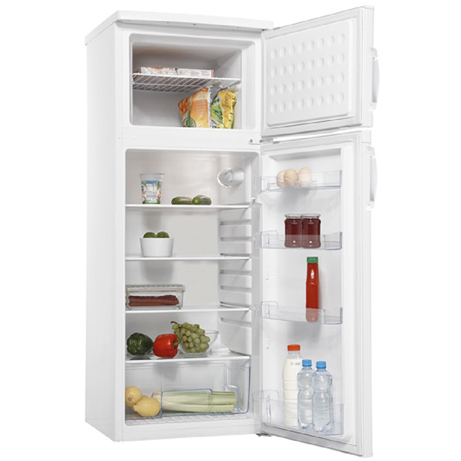 Antibacteria System protects foods and products inside the refrigerator from bacteria and mould which may cause unpleasant smells and shorten storage time. The Antibacterial System prolongs the freshness of food. Auto defrosting technology means your refrigerator defrosts itself automatically, saving energy and saving you the time, effort and inconvenience of manual defrosting. Shelves inside the fridge may carry up to 100 kg! They also feature an overflow protection as the raised frame around the shelves makes sure that liquid, for example spilled milk, stays on the shelf instead of dripping down onto lower shelves. Your fruit and veg remain as fresh as the day it was picked, thanks to the large and convenient vegetable crisper drawers. Ideal for storing fruit, vegetables and cheese – these have a streamlined shape and no hard-to-reach corners, ensuring they can be easily cleaned.